ScyberDragon posted a message on Holy Emoticons! I can't believe this site still uses all of the emoticons I made!!! My most treasured item is my Butcher's Cleaver. Being a fan since D1, the Butcher holds a special place in my heart. And the sound effect procs that they added only makes the weapon 10x more awesome. For those of you who would like to play some Uber bosses but do not have the gold to buy the uber gear, tryhardenmity has created a guide on how to maximize the limited gold you do have. For 3 million gold, the guide covers what stats and gear to dump your gold on to make it through most of Inferno with a Barbarian. You can check out his original thread for additional comments and suggestions. We reported the other day that some users thought there might have been a bug that increased the damage done by monsters. Blizzard checked these reports and have confirmed that there was no bug increasing the damage. However, some people still remain skeptical. This is exactly what we tested, and our analysis thus far has provided no evidence that the hotfix was "messed up" or reverted as a result of 1.0.5a. The damage values we implemented via hotfix are currently the damage values being used by monsters right now when MP is enabled. We're not calling anyone delusional or wrong for reporting a different experience; we're simply saying that the scaling bonus to monster damage at each level MP is (according to all the data we have) where it's supposed to be, and that it hasn't changed since Tuesday. That said, even though there's no evidence of a bug at this time, we're continuing to monitor reports and feedback over the weekend and will investigate further if necessary. A user on the Battle.net forums asked what people's most treasured items that they have obtained was. Grimiku, from Blizzard, has shared his and we would like for you to share yours. ScyberDragon posted a message on MP3 A1 or MP1 A3. If you are not strong enough to farm mp3 quickly. Then your best bet is mp0 act 3. No point in mp1 act 3. The only benefit is the slight mf increase but the monsters take longer to kill. The drop lvls will stay the same. Just breeze through mp0. Otherwise mp1 on any act. tryhardenmity is back with his video guides. Starting us off with the 1.0.5 patch, he has covered the Barbarian. Discussing the changes made to the class, he covers two different specs as well as gearing. You can check out his original thread for comments and feedback. Some players have voiced concern that Xah'rith, the key warden in Act III, is too difficult between his freezing corpse rain and illusionist abilities. However, Blizzard has stated that his difficulty was set intentionally and may tone him down if most players are finding him too difficult. It has been said before but Blizzard once again confirms that there has been no unannounced changes to drop rates from the 1.0.5 patch. They also reconfirmed that any monster level above zero will result in all monsters in inferno able to drop items level 61 - 63. - We haven't made any changes to drop rates or drop quality. - They are same as they were yesterday, when the patch went live. - We implemented some hotfixes this morning, but they weren't related to items at all. - Those changes can be found here. did they change the drop rates to be the same for every act yet? was just wondering didn't see it in the patch notes. Diablo III is up for Game of the Year from GameMaster's Golden Joystick Awards. For all of you Diablo Fans, stop by and vote for the best game. Curse recently interviewed Rob Pardo, Blizzard's Chief Creative Officer, at the Mists of Pandaria launch. While most of the interview is about World of Warcraft, Pardo did answer a few questions about Diablo. Diablo 3 sold very well but received mixed reception at release because of various problems. Blizzard worked really hard and greatly improved the game over the last few months but do you feel that the launch was rushed? Would you hold it a few more months if you had to do it again? The tricky thing about the Diablo 3 launch was the new codebase. 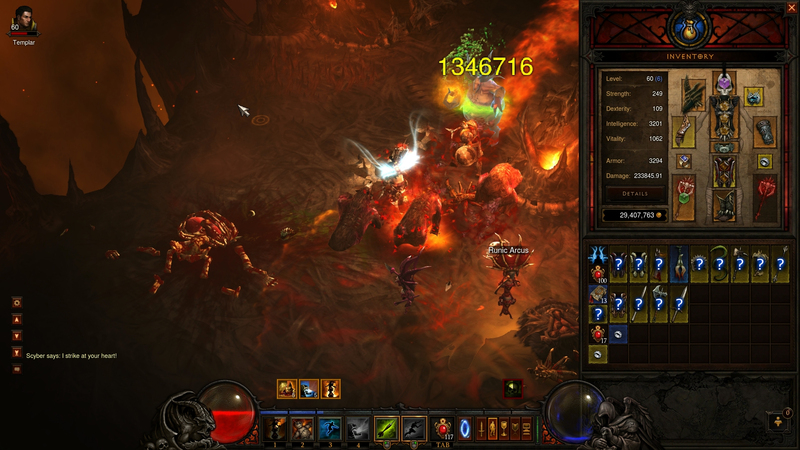 Diablo 3 was a whole new engine and Battle.net had just done a new major revision. It is very hard with the way that we launch games with millions and millions of players to test it. We had hundreds of thousands of players in the open beta without a lot of problems, but when we launched the game we had ten or twenty times that amount of players. Lots of things show up with that many players that don't show up with one tenth of them. I'm not sure holding it back would have uncovered a lot of those things. If you think back to World of Warcraft it was very similar. It was a whole new engine and battle.net platform, so it took us a while to plug all of the leaks and get the game completely stable. Now that we're a few months away from the release of Diablo 3, can you tell us how the real money auction house worked out for Blizzard? Are you happy with the feature and how it was received by players? Would you consider adding the same feature to new games, or even existing games? I would say that internally the way we look at the feature right now is mixed. I think it was really a big experiment and it is something that I think has done really well in some ways and in some ways has really changed the game a lot. I think it gets to be a very complex answer, because there is the component that is the real money auction house and there is the part that is the auction house. When you see a lot of complaints on the forums, they are talking about how it has gotten so easy to skip to the best items in the game and how it devalues your progression or advancement. A lot of that would happen with any sort of auction house, even if you are paying gold you have that same sort of feeling. You have to separate that from the real money component of it, which also has its own unique issues. Anyone that plays the game now looks at items with a dollar sign attached. With all of the different games out there that have microtransactions that is more acceptable, but in some peoples' minds it has damaged the purity of the game. One of the main reasons why we did it is that we knew there was going to be a lot of third party auction sites out there. We felt like it is already going to exist so we would rather give players a more safe and secure way of doing that. I think in that way it has been successful. We are really talking a lot internally though about the right way to evolve or iterate on the auction house. GamesIndustry interviewed Mike Morhaime, President of Blizzard, during the release of Mists of Pandaria. There were questions about all of the major titles including some about Diablo III. You can check out the entire interview over at GamesIndunstry. With Diablo III there were some issues with balance, with PvP being delayed, with the auction house - would you redo that launch if you could? Oh, there are definitely things we would do differently. It would be so helpful in advance to know how many people are going to want to play a game. Because we could plan things out a lot better: we can make sure we have enough capacity, we can buy the hardware that we need. The Diablo III launch exceeded out forecasts by an order of magnitude; we were very far off. We outsold our full-year forecast in the matter of a week. The interesting thing about Diablo III was you had announced a specific ship date very far in advance, which is completely unlike any other launch you've done. And earlier in the year you tore the guts out of the stats system. As an RPG designer I realize how difficult that is. Did that all make it harder to get the Diablo III launch out? I felt like we gave ourselves enough time in terms of the things we could test and the things that were feasible to test. We can't know how many people are going to come out and want to play. We ran an open beta where we let anyone in the world in who wanted to play the game for free for a weekend. But a lot of people were waiting for the release of the game so we really didn't have the indication that our forecasts would be off by so much. In terms of how people are playing their content, are you seeing a lot of multiplayer or is it single player experiences with Diablo III? I don't think the ratio has changed all that much in the past couple of months. Do you think the future of gaming is multiplayer rather than single player? Is multiplayer where the market is headed? We think the social aspects of gaming are really important, being able to share your experience with someone else. Even if you're soloing and not actually going through a dungeon with your friends, to be able to share that experience, to be online, to chat together, I think it adds dimension to the game. And that's important. With patch 1.0.5 still awhile out, there is still plenty of time to build up your characters on patch 1.0.4. tryhardenmity is still at it showcasing a couple of builds and gear choices for your Wizards. He will also be creating additional guides for any 1.0.5 changes. You can check out his original thread here for additional comments. Curse continually strives to improve and be the best gaming community out there. In order to do this, Curse wants to know what you, the players, are looking for? If you could please take a moment and complete the survey to make Curse an even better gaming community. Hey guys, I'm looking to spend about $1500 on a gaming laptop. Just wanted some input and opinions from more knowledgeable people. What's best for my buck? Yeah, getting a skorn with life steal is my next gear upgrade. Yeah, I put on SOJ on all of my guys. While I haven't gotten a perfect storm yet (5 stack sh, 5 hg, hexed, and nice crit roll), the highest crit I have seen so far is this one for 1.3 million. On average I am hitting for around 700k-800k per crit. Oddly enough, I was hesitant on gearing up my WD because I didn't think he could do enough DPS. I still need some Vile shoulders, set ring, and better Skorn. With those, I should be averaging over 1 mil crits. So, my brother farmed all day to get the keys for the infernal machine today. I got on and joined him to get the recipe. After finally getting it, we went to do the uber bosses. After dying twice, we had a nice groove going. We had Zoltun down to about 5% hp when the server DC'd. Our portal was gone and machine with it. Imagine I tell you "the WD has a shield skill".
" Yeah, so, most classes do. " you respond. Now I tell you "yeah, but this shield draws enemies away from you, and the shield will do 130% wep dmg to any monster near it, and the shield moves around chasing after enemies, and the shield replenishes itself and can potentially last forever". Now you say "holy crap, that's the best shield skill in the game. But wait I don't see this awesome shield skill". Need I say more. But seriously, all (and I speak only for myself when I saw all) love the WD primarily for its look and feel. I don't think any other class has 1/10 of the personality and character that the WD has. He is the only character I have, even with others über geared, where I look at my WD and say "man, he looks awesome". I think the biggest problem, and its actually not a problem, is that the WD doesn't have an über build like every other class has. There is no "this is the only build to play". He's great because of his well balanced skills. Sure some are weak and nobody uses them. But there are a lot that are viable, unlike other classes. Want summons, do it. Want ranged, darts and poison cloud. Want to be closer, zombie bears. There are a ton of viable ways to play this class. BTW I have been on the WD bandwagon since announcing D3 and was the first class I played to 60. 1. Yes, all new keys are needed to craft more than one machine. 2. No, you do not need to get the plan again. Just once to teach your BS. 3. It appears each ring mat drops from specific über bosses. Although this is not verified. They did get two different mats from two different bosses. 4. You can craft multiple machines and open multiple portals at the same time. 5. Not sure about the ring props. Since its legendary, it's possible but more likely it draws from the ring prop pool. yeah, i noticed that too. The original said 59. I would not see any reason for it not to include 60. If you want to do it without dying, you need some LoH. Its better to stay alive and do a little less dmg than die occasionally with more dps. ScyberDragon posted a message on [April Fools] [Datamined] New Class: Necruid and Second Expansion Hints! I don't mean the amount of hours he put it. Just the fact that he just enjoyed playing the game. He didnt even plan to hit 100 until he was 40. I liked the interview. It showed that he is just a normal player like the rest of us. Much more appealing than some person who thinks they owned the game and exploited all of its fault and thinks its "too easy". He just leveled enjoying the game. and my summons can finally come with me to inferno!!! I really hope this new "loot technology" is cool new item properties that only legendaries can have. That would definitely make them wanted without having to make them best in DPS. I actually might try co-op for inferno now. Might be better than going at it alone now. Just got the plans. Now all I need is the 150K gold. not to mention there are tougher unique monster affixes for inferno. For those who complained this was a not a good end game. Lets see how long it takes. Angel battle for the win. Now the question, is that how the game starts. Maybe the fight starts it all and one of them is thrown down to sanctuary and that's the comet. sorry, that 5 slipped in there. Just too excited for release day. May 1 is when beta is ending, as in 6.5 hrs from now. ScyberDragon posted a message on Open Beta Weekend! Let's slay together. Yeah. Yeah. Yeah. If I can't play until 3 (east coast) I'm sleeping at 6 on the 14th, waking up to get my ce at midnight and playing for at least the next 18 hrs.